In terms of efficacy and nutrition turns out that black rice pigment has the best efficacy compared to other colored rice. 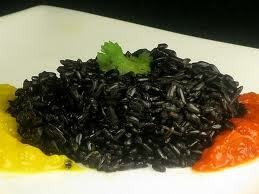 'Black Rice' is very different than the 'black sticky rice', good taste, aroma and appearance. Very specific and unique. When cooked 'rice black' color is really black. Tastes good and smells unappetizing meal.